A sprawling assortment of technology companies and online-content providers are kicking off a public campaign today to stand up for “net neutrality” protections, which advocates say schools rely on to get academic resources they need. Companies like Facebook, Reddit, and Netflix have broadcast statements supporting the “Day of Action” effort. And many others have committed to lending their backing, according to one of the advocacy groups organizing it, Fight for the Future. Google said it was participating in the campaign, but declined further comment to Marketplace K-12. Google is a dominant player in the K-12 arena as a provider of operating systems for Chromebooks and as the creator of G-Suite, a classroom collaboration platform widely used in schools. 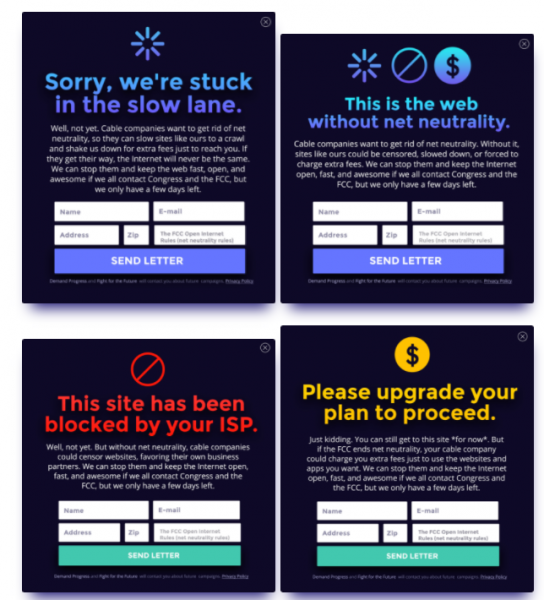 The new campaign has been sparked by recent efforts by the Federal Communications Commission to roll back regulations adopted two years ago that were designed to protect net neutrality. Net neutrality holds that all content delivered through the web should be treated equally by internet service providers—rather than allowing those providers to deliver some materials at accelerated speed while throttling or blocking other content. Some school officials and librarians fear that if net neutrality is undermined, telecoms could give faster delivery to deep-pocketed content providers while restricting the flow of academic materials from nonprofits and other sources to educators. In addition, some ed-tech advocates argue that weakening net neutrality could make it harder for potentially innovative startup companies to break into the K-12 market, if they’re thwarted in getting their content to schools. In 2015, under then-Chairman Tom Wheeler, an appointee of President Obama, the FCC protected net neutrality by reclassifying broadband service as subject to regulations under Title II of the Communications Act and section 706 of the Telecommunications Act. Regulations approved by the FCC forbade internet providers from creating “fast lanes” for delivering internet content, and from degrading or slowing other content. But President Trump’s nominee to head the FCC, Republican Chairman Ajit Pai, has said he sees the FCC’s earlier actions as federal overreach, and since taking direction of the commission he has moved to dismantle the earlier rules. Pai contends the earlier policy stifles business innovations by internet service providers and that the Title II provisions create a level of regulation on online providers that was excessive. Previous FCC action amounted to the agency seizing “unilateral authority to regulate internet conduct to direct where internet service providers make their investments, and to determine what service plans will be available to the American public,” Pai once said. In May, the Pai-led FCC gave initial approval to a notice of proposed rulemaking that would reverse the FCC’s decision two years ago and eliminate the Title II regulation on internet service providers and place them under what the agency describes as “light-touch” policies included in Title I of the federal Communications Act. The FCC is now seeking comment from the public on whether the FCC should “keep, modify, or eliminate” the earlier commission policy. With the “Day of Action,” the backers of net neutrality hope to convince the agency to uphold the previous rules, and they want to pressure Congress to take that stance, too, said Evan Greer, the campaign director for Fight for the Future, in an interview. The comment period ends on July 17. Greer said the Day of Action is just one part of a sustained effort to encourage the public to make their views known to the commission. Both Zuckerberg and Facebook Chief Operating Officer Sheryl Sandberg posted statements on the company’s platform Wednesday plugging the campaign and saying they would urge federal lawmakers to fight for net neutrality. A spokesman for the FCC declined to comment on the campaign. Many of the biggest tech companies that operate in the consumer space have very different views of, and interests in protecting net neutrality, based on their online traffic and delivery of content, including video streaming, as this incisive piece in Wired points out. And not all of the companies and organizations backing the Day of Action have the same vision for what net neutrality should look like. In an online post, AT&T’s vice-president for external and legislative affairs, Bob Quinn, said the telecom supports a “bipartisan regulatory approach” to net neutrality. But he also warned against saddling internet service providers with “heavy-handed, outdated telephone regulation,” and said the 2015 FCC provisions went too far. Net Neutrality is government control of the internet. And Big Cable loves Net Neutrality, because it raises the barriers to entry for any startups that want to compete against them. No, I don’t want the government to be deciding what ISPs do. We need an environment where more competition can flourish in providing internet access, not less. We need to get rid of Big Brother watching over the internet. Get rid of so-called “net neutrality”.